Hi once again from Joussard School. There were lots of eager kids providing me with information as I walked around today, visiting each classroom. In kindergarten, I heard the students are working on the letter ‘S’. They told me they used bingo daubers to make this letter, they made it with Playdough and in the sandbox. All of these activities should sure help the little kids remember this letter. The kindergarten students also told me about the fun they have been having in the gym playing with a parachute. Our Grade 1 students have been learning about hibernation. They are drawing pictures of bears hibernating as well as using materials to create scenes of hibernation. The kids reported they are having fun playing dodgeball in their P.E. classes. In Grade 2, our students let me know they love the afternoon because they get to move to “Just Dance.” This is a great way to stay fit and to get rid of extra energy! The Grade 3 students continue to use Base 10 Blocks in order to understand addition and subtraction with regrouping. They also reported they are building barns in Science. This should be interesting. Students in Grade 4 have been learning all about gears and how important they are in our machines. They have also been brushing up on their multiplication skills in Math. 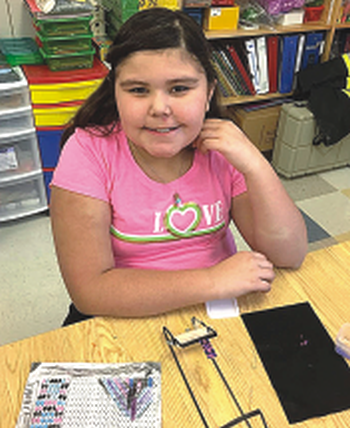 Grade 4 students are greatly enjoying their most recent Cree classes as they are learning the traditional skill of beading. They put a great deal of work into planning and creating their designs and are now transferring them into their beadwork. Beautiful work! In Grade 5, our students reported they did an experiment about solids to determine if they are reversible or irreversible. In Social Studies, the students are working on a retelling story project. 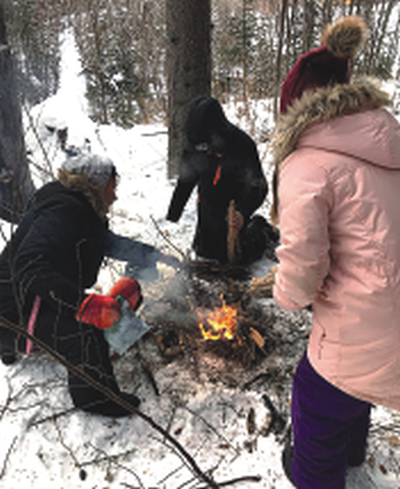 The Grade 5 students had a great, if chilly, land-based learning experience last week. They learned how to survive in the wilderness by making fires and a shelter. This is good knowledge to have and may save their lives someday. And, in Grade 6, our students informed me they did an experiment in Science to learn about air and aerodynamics. This was fun. In Social Studies, they are learning about Aboriginal Collective Rights. Everyone enjoyed the cross country skiing and are looking forward to Spirit North coming back next month. Thanks again for reading my reports! 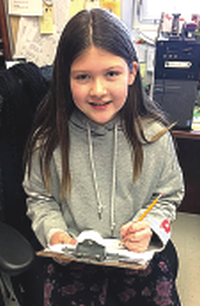 Pretty in pink, Joussard Grade 4 student, Samara Laboucan, works on an intricate beading project she designed herself. Joyce Hunt shows Joussard School Grade 5 students how to build a fire on a very cold day. This is an excellent skill to have.